It’s the summer before 7th grade. Spunky, headstrong Violet Raines plans to do what she always does; go to fish fries with her best friend Lottie, bike and explore with her friend Eddie, and watch the thunderstorms her sleepy town of Mitchell Hammock, Florida is famous for. But when new girl Melissa Gold shows up from Detroit, she threatens everything that Violet holds dear. Soon Lottie is more interested in soap operas and makeovers than swimming and alligator hunting. Despite Lottie’s attempts to bring the trio together, Violet and Melissa just can’t seem to get along. When lightning literally strikes, Violet must decide what’s more important: desperately clinging to the past or embracing changes for the future. 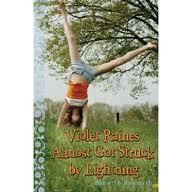 Violet Raines Almost Got Struck by Lightning is a wonderfully sweet story about that precarious time between childhood and adolescence, growing up and the power of friendship. J. J. Tully is a retired search-and-rescue dog who’s living out his glory days on his trainer’s farm. Compared to the excitement and danger of his previous job, farm life can be rather boring. When a wacky chicken named Millicent (Moosh) shows up in the doghouse doorway needing J. J.’s help to find her two missing chicks, Poppy and Sweetie, he quickly negotiates cheeseburger payment and is on the case. The trouble with chickens, J. J. soon realizes, is that they’re hard to read. And they get in the way. And they possibly know more than they say they know when they know it. If J. J. is going to have any chance of rescuing Poppy and Sweetie from the evil house dog, Vince the Funnel, he needs all the information…and someone’s not talking. From the author that brought us Click Clack Moo: Cows That Type, Bounce, and Wiggle, comes a new series for young readers. 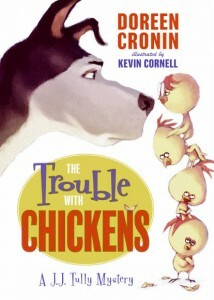 The Trouble with Chickens: A J. J. Tully Mystery is Doreen Cronin’s first venture into chapter books. This book has been getting a lot of love around the kidlitosphere and I can see why: short sentence structure, a mix of familiar and new vocabulary, dead-pan humor, vivid descriptions and a fast-paced plot make this a good choice for a read-alone or read-alouds. However, I felt the shift between narrators was a little awkward at first and that I didn’t have those laugh-out-loud funny moments others were raving about. I really, REALLY wanted to love this book, but for whatever reason the elements didn’t come together for me. Still, I can see the appeal for many readers in The Trouble with Chickens and would have no problem recommending it. See other reviews at A Patchwork of Books and Bookends.